While in Vientiane, I went to Carol Cassidy’s shop, Lao Textiles. 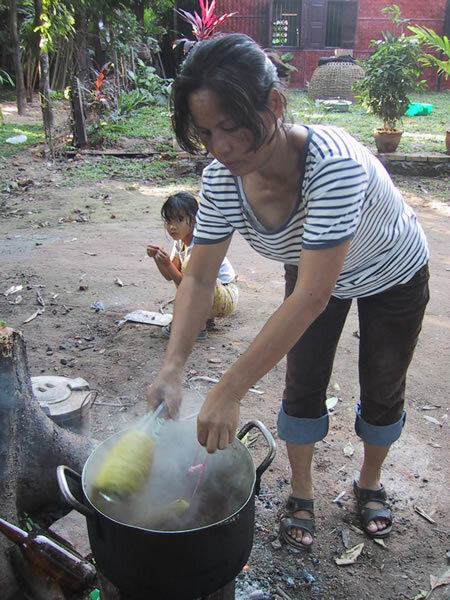 Lao Textiles was founded 14 years ago and was the first foreign business in Laos…it produces museum quality textiles designed by Carol Cassidy, based on traditional Lao patterns and woven by some very skilled weavers. 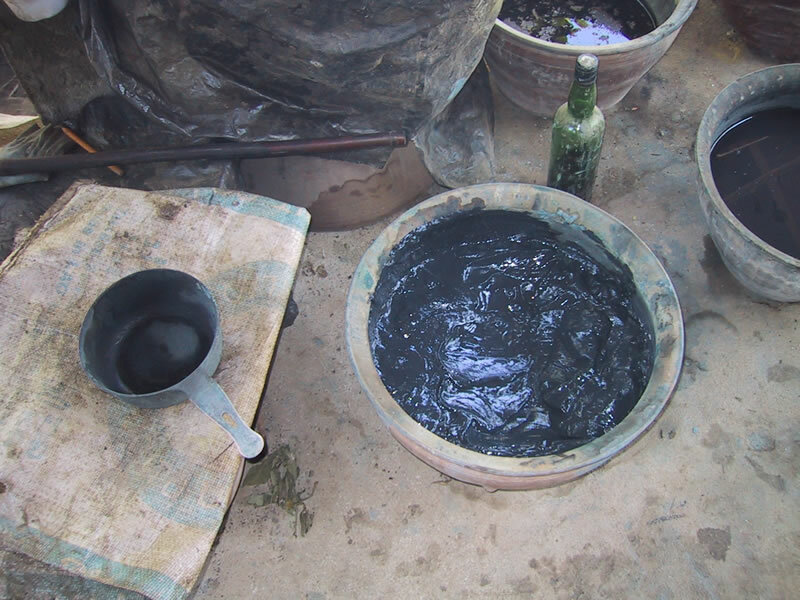 They were kind enough to let me take photos in their workshop…they also introduced me to a natural dyer named Dong, who was kind enough to do a natural dye demo for me. 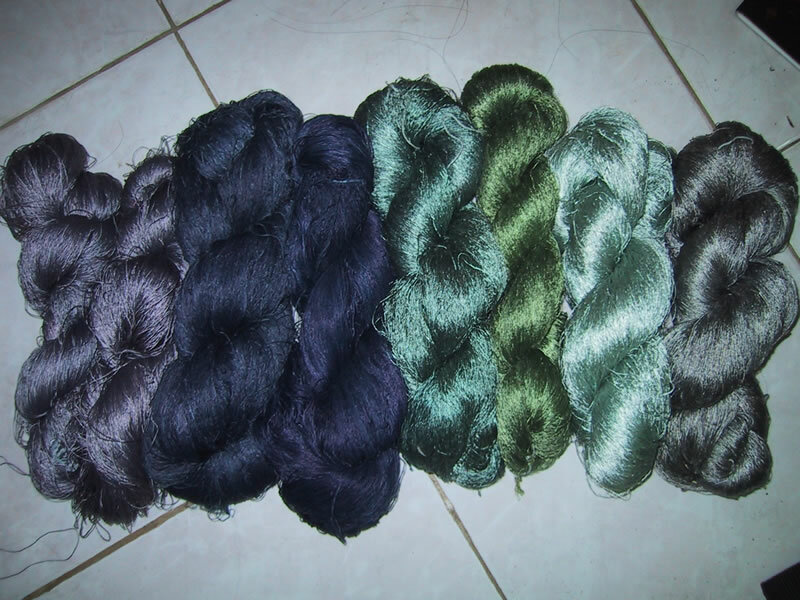 A collection of indigo-dyed skeins I bought from her. 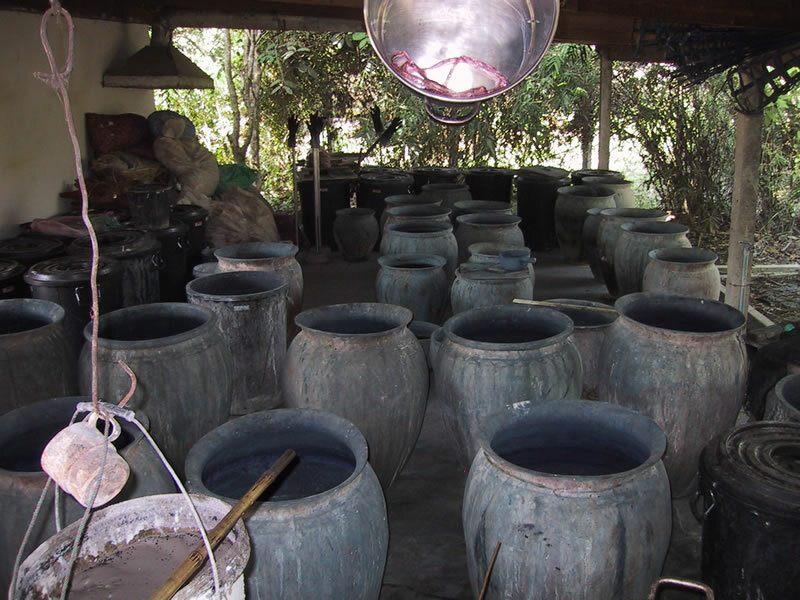 They are all dyed with indigo, using different methods--the lavender, left, involved soaking the indigo for three days, then boiling a dyebath; the silver, right, was made by pouring a bottle of Lao whisky into a barrel of indigo leaves and water, leaving it for three weeks, and then boiling the dyebath. 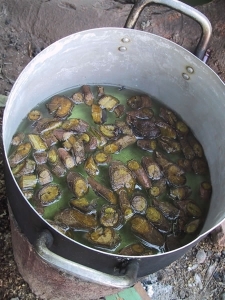 This is a traditional recipe! The roots simmering in the dyebath. They produce a very strong yellow color, but it apparently fades over time. Dong, stirring the yarn in the pot with a glass bottle (the equivalent of a chemist's glass rod). Scouring away the sericin, by simmering in soapy water. Notice the wood burner at the bottomto turn up the burner, push the board in, to turn it down, pull the board out. 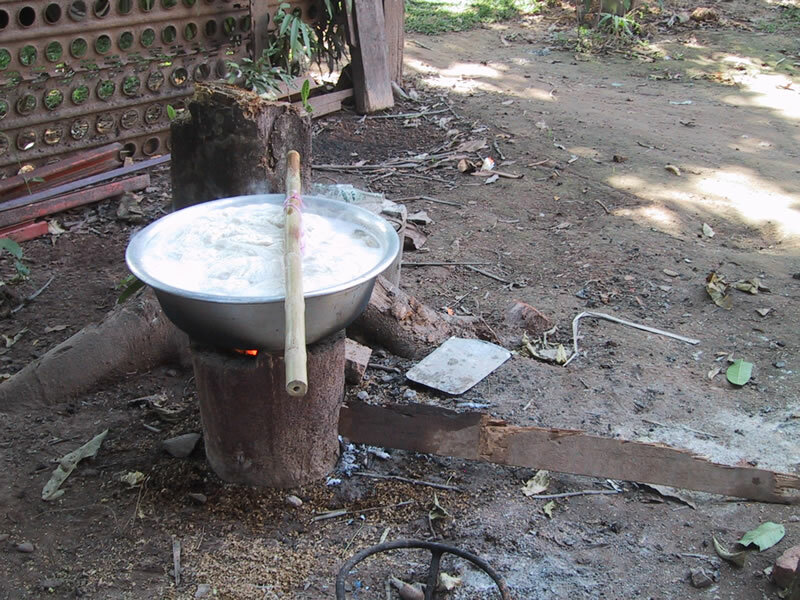 Almost all cooking in Laos is done over wood stoves. Skeins of reeled silk. 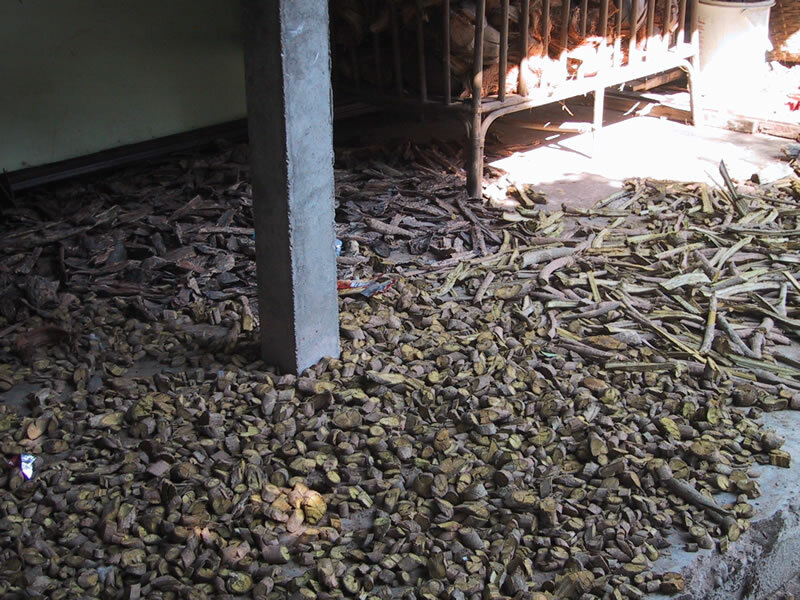 It still has the sericin (gum exuded by silkworms to make the silk stiff/sticky) in it, so it is stiff. 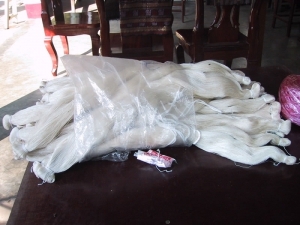 The sericin must be removed before dyeing. 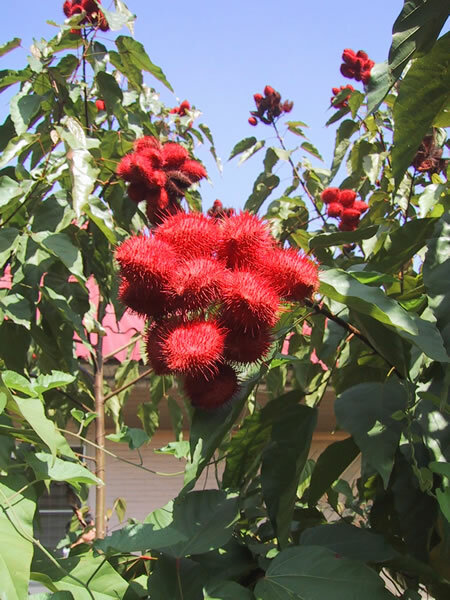 The annatto tree. 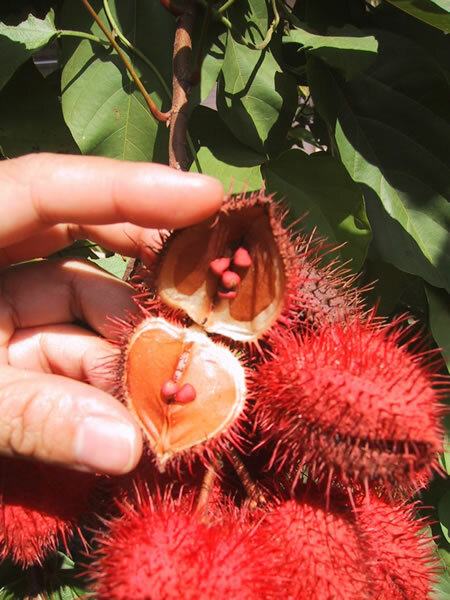 Annatto used to dye butter yellow in the U.S.--look on the ingredients list of your butter, sometime. An annatto seed pod. They're beautiful, heart-shaped and sort of furry. 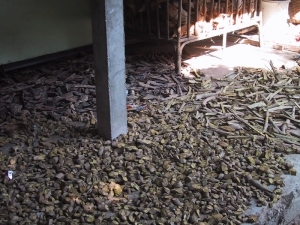 More seed pods. The strongly colored seeds are used for a beautiful, strong, yellow-orange. Unfortunately, though, it is fugitive--it fades with washing and exposure to light. 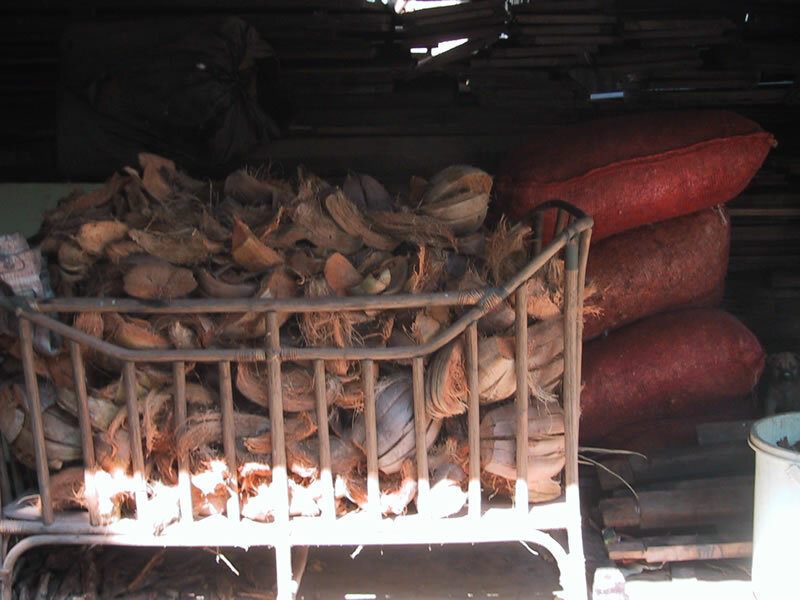 Coconut husks. They produce a lovely rose color. Dong with her dyed skeins. She has an astonishing array of colors--she learned from her mother. Chopped up roots of a woody vine (no English name) that Dong used in the dyeing demo. Indigo dyevats at the Japanese weaving center. 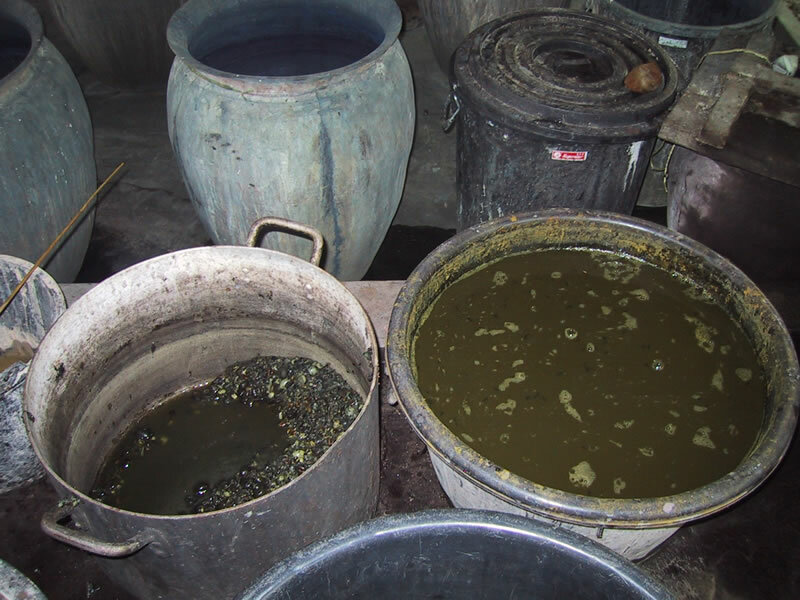 Indigo is nearly unique among natural dyes in that it is a vat dye--it is dyed cold and the color is built up through successive dips. Natural indigo contains both indigo blue and indigo red--they are both vat dyes, but dye at slightly different temperatures. 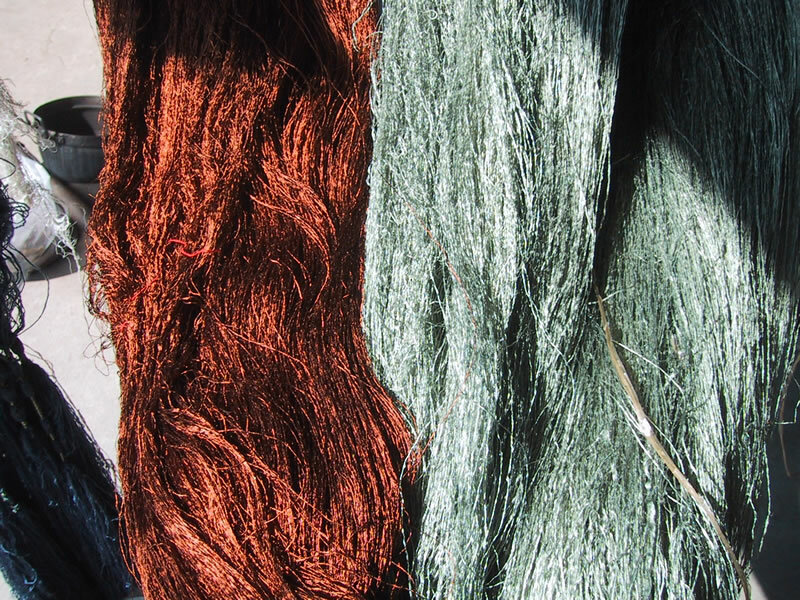 A cold dyebath gives a bluish cast, a warm dyebath a redder blue. 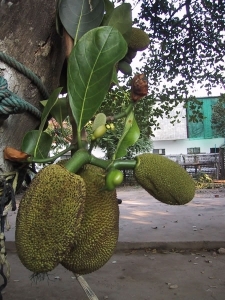 Jackfruit. A highly versatile tree (and a relative of the smelly durian fruit), it produces giant, sweet fruits and a nice yellow-orange color from the heartwood. 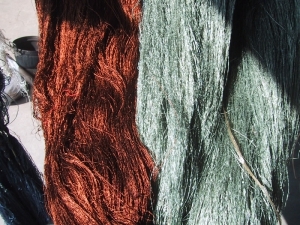 Two skeins dyed with Ma klua. 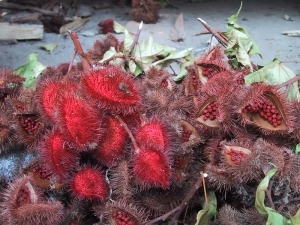 Ma klua (Thai ebony) fruits soaking. 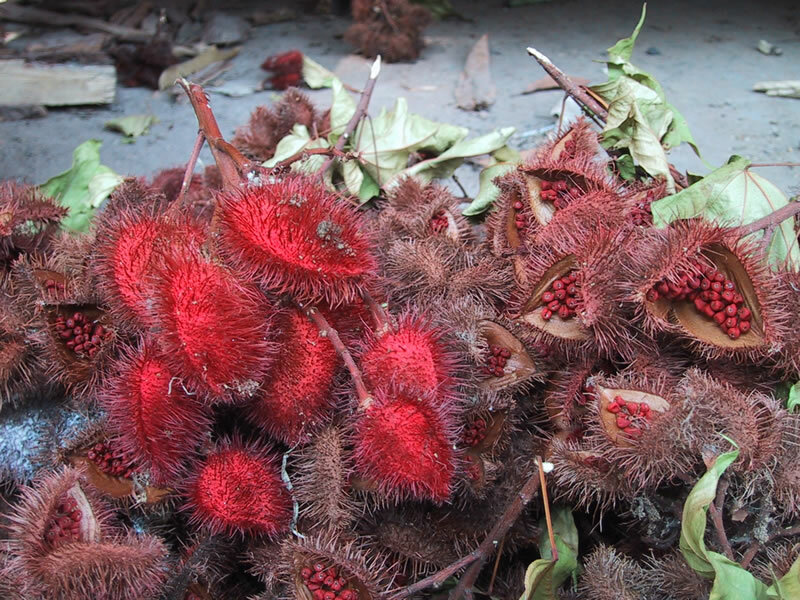 Ma klua has a very short season, but the fruits are so rich in tannin that they can be dumped into water and kept year-round, as in the photo. It dyes brown to grey to black, depending on the strength and method. Pot of indigo paste, at the natural dyeing/weaving center.